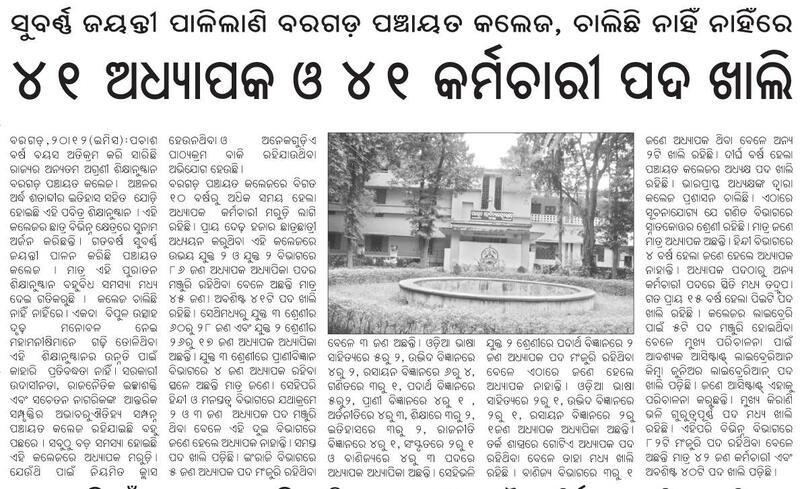 Entry filed under: Baragarh-Padmapur, Bargarh, Government and aided colleges, Higher Education Zone, Panchayat College, Bargarh, Region watch. I am proud to be a student of Panchayat College ,Bargarh,where one of my friends is lecturer now.He is overburdened with extra charges for shortage of teaching staff.Really speaking Government is neglecting Education Department in Odisha,the result of which is this state is backward and undeveloped in comparison with neighbouring states.First of all from primery level to P.G. level all staffs should be filled up. Reappoinentment of retired lecturers should be banned .New talanted young mass who have adequate qualification but with or without experience should be given full-fledged employment .It is duty of local people literate mass to force government to fill up all vacancy in warfooting manner.